What was your background before ABC? I grew up in Sacramento, California where I fell in love with jazz. Some of my childhood musical highlights include performing with Dizzy Gillespie at the Monterey Jazz Festival and playing with my Dixieland band on the Mickey Mouse Club show at MGM studios. After high school, I attended Lawrence University in Appleton, Wisconsin where I graduated in 1997 with a Bachelor of Music in Music Education, Classical Music Performance, and Music Performance with an Emphasis in Jazz Studies and a Bachelor of Arts in Government with teaching certification in Political Science. 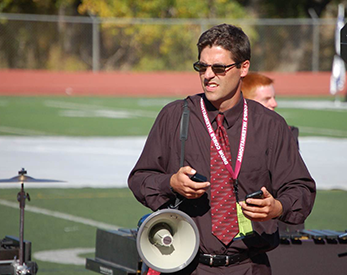 I then moved to Colorado to begin my music-teaching career as the assistant band director at Loveland High School and Walt Clark Middle School. The following year, I became the director of bands at Walt Clark Middle School in Loveland, Colorado. I found out about the American Band College from my roommate at the first Essentially Ellington Jazz Workshop for band directors at Snowmass, Colorado. 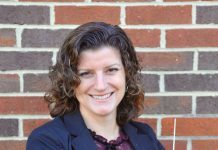 I was immediately intrigued by ABC’s focus on improving band directing skills, the quality of the faculty, and its timing in the summer so that I would not have to leave my teaching position to earn a masters degree. Name some other accomplishments or awards since graduation. Upon graduation from the American Band College in 2003, I was fortunate to be invited to join the staff of ABC and the Western International Band Clinic. While I was teaching at Walt Clark Middle School, my top performing group – the honor band – was a featured performing group at the Colorado Music Educators Association Conference in 2003. Moving to Loveland High School to become the director of bands in 2005 gave me more opportunities to employ what I had learned about repertoire and rehearsal techniques at the American Band College. The LHS Wind Symphony was featured at CMEA in 2008 and 2011 as well as at the Western International Band Clinic in 2011. The LHS Marching Band was the Colorado State Marching Band Champion in 2009. 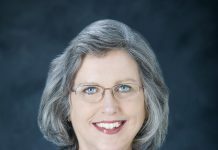 What I learned about leadership and working with people from the faculty at ABC greatly influenced my personal growth as a leader and teacher of leadership. In 2006, in response to the need for leadership training among my high school students, I created the Leadership Symposium, a forum for discussions on leadership principles and a venue to give voice to student ideas. 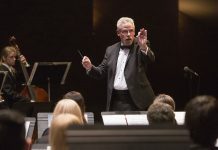 Its success has led to presentations and clinics on leadership and unlocking potential at the Midwest International Band and Orchestra Clinic, the Western International Band Clinic, Music Educators Association Conferences in Wisconsin, Oregon and Colorado. As a Conn-Selmer Music Education Representative, I now give clinics on leadership, rehearsal techniques, saxophone and conducting. I also conduct camps, festivals and honor bands around the country. This May 2016, I will be guest conducting, giving the keynote address and performing a saxophone concerto in Nicosia, Cyprus at the first Wind Band Conference ever for the countries of Cyprus and Greece. The connections that led to this invitation are through mutual friends from Lawrence University and the American Band College! This summer, I am excited to be joining the ABC faculty to present sessions on teaching the saxophone and leadership. How did ABC help prepare you for these? I am grateful for the incredible education and connections that I made as a student at the American Band College. Every moment in class, and outside of class, helped prepare me to continually grow as an artist, conductor, music educator and personal growth motivator. Not only did I learn valuable content and knowledge from world-class faculty but I also learned about character, connecting, drive and excellence from the caliber of people that teach and study at the American Band College. I had the opportunity to play saxophone in ensembles conducted by conductor role models such as Frank Wickes, Colonel Lowell Graham, Colonel John Bourgeois, Anthony Maiello, Tim Lautzenheiser, Frank Ticheli, and Peter Boonshaft. I would not have had the opportunity to work with so many incredible teachers at any other traditional university setting. In addition, networking and learning from the close to 200 students each summer was invaluable. What was your most memorable ABC experience? I have so many fond memories from my time at ABC but one that comes to mind is sharing drinks and dinner with Colonel Lowell Graham, Anthony Maiello, Tracy and Amy Wright at Pasta Piatti in downtown Ashland. We also had some great drives to Crater Lake, the Pacific coast and the Redwood Forest on our days off. Who are your biggest influences/mentors? Max McKee and Tim Lautzenheiser are two of my biggest influences and mentors. Both Max and Tim are examples of dreamers who have made their dreams realities. If Max and Tim had not gotten together, dreamed up ABC and WIBC and continually improved them, the programs would not be the thriving, life-changing events that they are today. Both ABC and WIBC are about putting people first and creating a family atmosphere designed to help students succeed at their highest level. What advice do you have for young directors? In addition to learning as much as you can about music, instruments, and rehearsal techniques, remember it is about the individuals that we teach. We need to truly connect with our students in order to make the greatest difference. The words of Teddy Roosevelt are just as true today, “nobody cares how much you know, until they know how much you care.” Never stop learning; our personal and professional growth continues as long as we are open to new ideas and have a strong desire to improve. Keep performing on your primary instrument to keep your passion and musical skills fresh and alive. So much has happened in the past few years that it is hard to think about what the next 10-20 years could bring! I hope to continue my work as a professor, presenter and conductor to elevate the quality and importance of music education and artistry around the world.